Are you scared to try new things? Wonder what others will say? One of the main themes in this book is that you are unique and I am unique. The footprint we leave on the world can be unique if we allow (and push) ourselves to be who we are, not who others/environment/culture think we should be. The one area we are alike – we all find more fulfillment in life if we are truly being ourselves and doing what we are best at. That can mean being self employed, working with one or two others or working in a corporation. There’s many things that stop us from even trying, like worry. “Anxiety is practicing failure in advance.” Some of his thoughts on how we rationalize not doing something made me feel like he was eavesdropping on the conversations I have in my head. Godin’s writing style is sharp and easy to read. The message in this book isn’t necessarily new, but it’s important, especially with all the changes the internet is bringing to our world. He does a great job reminding us that we have a lot of choice in what our personal world looks like. Choose to flip the switch in your mind. stop fretting about with insecurity and doubt. or choose to bring out the worst in them. or a scattered ray of light that doesn’t do any good. Leave your name before 9PM on Thursday and you could a hardcover copy of this book. Winner will be randomly chosen and posted Friday morning. Subscribe to this site so you don’t miss a Winning Wednesday. Am I suppose to leave it my name here? Is so… my name is Kevin Rush and you can get in contact with me at [email protected]. Yes, Kevin – you left your name at the right place. Good luck! I've been trying to figure out "what I want to do when I grow up" for a few years now. I'm thankful for guys like Seth that make you realize that you're not alone in this mind set. Gary Vaynerchuk's Book "Crush It" helped me get a few steps closer to figuring out what I would like to do. I think many times as we are growing up adults make it sound like you will just fall into your passion and you'll love what you do. They leave out the part that it's HARD to figure out what your passion is, and they only one you should listen to YOU. Sounds like a 'must read' to me. Throwing my name in the ring. Thx Janet. I like Seth. I like his haircut! I think I would like to read this book. I'm at a crossroads and need to chart the second half of my life! I feel greedy because I won last week but after reading your review I can't resist signing up again! I like Seth's thinking. Thanks, Janet! What a great give-a-way. I'm in. Last week my husband drew the winner from numbers I put in a 'hat' but I learn new things all the time and this week I heard about random.org so I used that this week. 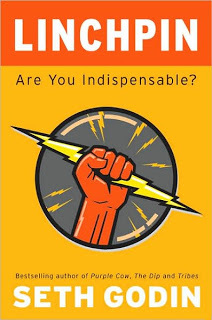 And Ryan Nelson – you are the winner of Linchpin! Congratulations!